MAC scholars sponsors a school wide talent show. The beginning of the Battle’s Got Talent idea started during summer school in 2018, which sparked Battle’s first ever talent show called “Battle’s Got Talent” sponsored by MAC scholars. On March 4 in the PAC, 14 acts were shown at this event including signing, dancing and playing an instrument, along with the help of the Improv team who performed various acts every three performances. Sophomore Amaya Daniels helped coordinate all of it and explained how the process of the talent show went. “Mrs. Lewis came up to me with the idea of creating a talent show. Then we held tryouts and after that we had dress rehearsals to prepare for the actual talent show and then by the time from dress rehearsals to the day of the talent show we recruited people to work with stage production, ushers and for ticket box,” Daniels said. During this process, Daniels also faced some emotions when it came to preparing for this event. 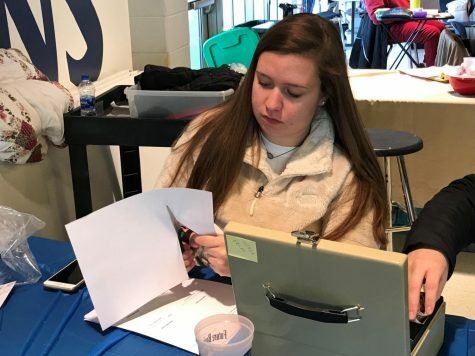 “I was very anxious the whole time and also really overwhelmed, but at the same time I was glad to be helping other people and up and moving during the talent show instead of sitting there,” Daniels said. Daniels also explained how she was inspired by how her middle school, Oakland, ran their talent show. “I just started doing everything that I knew on what my middle school talent show did. I was influenced by their style and made it simpler, so that Mrs. Lewis could follow easily,” Daniels said. Sophomore Dolona Betts was one of the performers who did a lyrical dance while her partner Ajrianna Bean sang. She explained how she felt on the day of the talent show. “I was confident, but at the same time I was nervous because I kept thinking I was going to mess up, but I just kept thinking positive,” Betts said. Since this is their first time putting out a talent show, Lewis commented on how the talent show went. “It went surprisingly well, and it went well because of the people that volunteered to help because I had no idea what I was doing. I just thought of having kids go on stage and do their thing, which was so far from the truth,” Lewis said. Lewis said she is very thankful for the people making this happen. “I just want to thank everyone that came out and supported the students, and I wanted to give a shoutout to Molly Fox and her crew for helping out with lighting and stage production, to Mr. Smith, to Mrs. Nunnelly and Amaya Daniels for coordinating everything,” Lewis said. The winner of Battle’s Got Talent was Natalie McNeeley for her performance singing and playing the guitar.